You know, you never know who makes up a lot of this stuff. I mean, we have so many terms and myths that are ascribed to different parts of life and the world that we often never really stop to wonder how they came about. Take “honeymoon”, for instance. Everyone knows the modern-day meaning. It’s that all-too-brief period of time immediately following a wedding, when the bride and groom are locked in connubial bliss. It’s often associated with a get-away or vacation, usually somewhere romantic. The term also elides into any relationship with a formal initiation and the happy period of time that follows that beginning phase. Heck, even pro athletes traded to a new team are said to enjoy a “honeymoon” period. When the full moon emerged from the darkness of June 20 this year, it was hanging low in the sky and coincided with the summer solstice for the first time since 1948. With its complete face reflecting the summer sun and the angle of the moon being so low, all that light funnels down through the maximum amount of atmosphere. The shorter, blue part of the light spectrum filters out and the longer, red colors dominate. The lower frequency red light plows right through the molecules of the atmosphere rather than bouncing off them like the shorter frequency blue lightwaves. Think of it like this: The high frequency blue light is like the high frequency cymbals or vocals in a recording. When your neighbor upstairs — or in the Escalade next to you at the stoplight — is playing loud music, the high frequencies bounce off the walls. But the low frequencies of the bass and kick drum merge right through and all you hear then is low end. Same with light. High frequencies like blue are bounced around in the atmosphere and low frequencies like red make it right through. So we see a red moon when it’s low in the sky. Thicker the air, redder the tone. I’ll have what she’s having. So, back to connubial bliss, honey moons and legends. Bees make honey. In the Northern Hemisphere, the first honey harvest of the year might naturally come as we approach June. Spring flowers, rain and moisture help enable that. Among the many benefits of honey is its wonderful use as an ingredient in the fermented beverage we call mead. 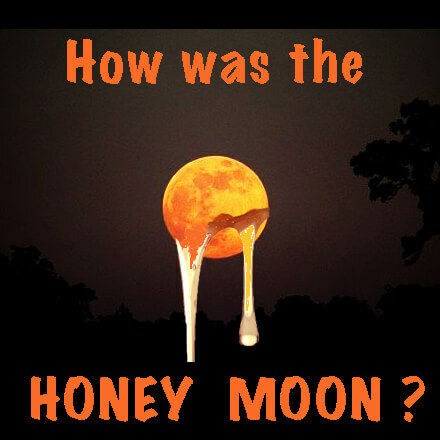 Said to be an aphrodisiac, mead depends on honey and the June moon is aptly called the Mead Moon or Honey Moon. Get married in June and ride the Honey Moon. The old way. Civilizations closer to nature, most of them extinct by now, timed the seasons with galactic events, including phases of the sun and moon. Traditionally, the full moons would earn specific names that varied from culture to culture but were usually of similar essence. The June full moon has been called Honey Moon and Strawberry Moon. Notably, New Agers like to make up new, cutesy names for the full moons while claiming the names were traditional. May as well liken Peter Max to petroglyphs. There are literally dozens of names for each of the 12-plus full moons that occur in a year, varying by culture or frame of reference. But as far as we can tell, the following moon monikers have some basis in tradition if not just plain common sense. Wort Moon is the full moon following the Mead/Honey Moon. Healing herbs were traditionally called worts and examples include mugwort, lungwort, liverwort, hogwort and St. John’s wort, typically harvested on St. John’s Feast Day. Midsummer is time to harvest these medicines. And any readers still skeptical of the healing power of plants, consider this. No one can deny that a plant can cause hallucinations (marijuana, mushrooms, Salvia divinorum). Who can deny the intense itch from just a slight encounter with poison ivy, oak or sumac? And hemlock and mandrake root can outright kill. It is then logical to acknowledge that plants can heal, also. This moon is also called the Buck Moon and Thunder Moon, among other names. Corn Moon falls next, as grain foods begin to mature in August. Also known as the Red Moon or Sturgeon Moon. Harvest Moon is next and is one of the famous ones, self-explanatory. Pacific Northwestern indigenous peoples called this moon the Salmon Returns to Earth Moon as it usually coincided with the local salmon runs upstream. Hunter’s or Blood Moon follows and is just what it says, marking season of killing and preparing meats. Metaphysically and spiritually it is one of the most profound full moons with its obvious connection with the Circle of Life. The absolute best read on this moon comes in Jessica Prentice’s Full Moon Feast (Chelsea Green Publishing, 2006.) With a knowledgeable take on the cultural significance of life and death in the food chain, Prentice enlightens and provokes deep thought on what it means to live and eat food. Prentice happens to be one of the foodies in the Bay Area who coined the term locavore. Snow Moon follows the Hunter as autumn turns to winter. This is also the Beaver Moon as those rodents prepare for the cold ahead. By December, we’re at the Cold Moon or Popping Trees Moon as deep cold sets in. Wolf Moon is next. The Lakota called it descriptively Frost in the Teepee Moon. Trapper’s Moon, Deep Snow Moon and Raccoon’s Rutting Moon are the February names, the latter being common to the Native American Oto tribe. The Sap Moon, Egg Moon and Moon of the Shedding Ponies (Lakota) are names of the March, April and May full moons. All are descriptive of the world around us. Other cultures blend other observations into the names of the various full moons. No such names would ever have been coined by our modern culture perambulating with head tilted, staring at an iPhone.